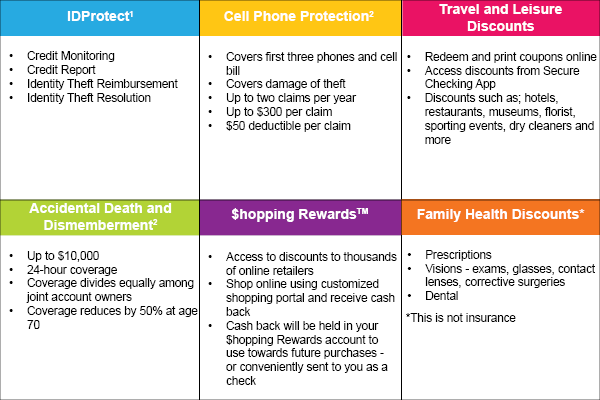 For $5.00 per month, Secure Checking offers much more than securing your credit and protecting your purchases. Receive all the benefits and more by signing up for our most protected checking account. To sign up, simply log into www.securechecking.com with your access code (received after signing up) and follow the step-by-step instructions. 1IDProtect service is a personal identity theft protection service available to personal checking account owners and their joint account owners. The service is available to non-publicly traded businesses and their business owner(s) listed on the account (service not available to employees or authorized signers who are not owners). Service is not available to a “signer” on the account who is not an account owner. Service is not available to clubs, organizations and/or churches and their members, schools and their employees/students. For revocable grantor trusts, the service is available only when a grantor is serving as a trustee and covers the grantor trustee(s). For all other ﬁduciary accounts, the service covers the beneﬁciary, who must be the primary member (Fiduciary is not covered). Insurance Products are not insured by NCUA or any Federal Government Agency: Not a deposit of or guaranteed by the credit union or any credit union affiliate.